Its summertime in Alberta, and bear season is in full swing! Breeding season – late May through July – is still upon us, so in addition to actively searching for food, bears are looking for mates as well. This means that people need to practice extra care while working, living, or recreating in bear country. Most bear encounters, whether its grizzly bears or black bears, can be avoided in the first place. It is up to us as the public to be informed on the different ways in which we can prevent them. 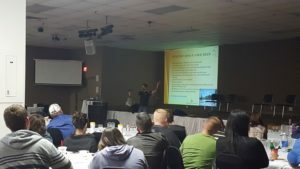 Alberta BearSmart is a program geared towards reducing human-bear conflicts and increasing public stewardship in the province by providing information and educational materials to the public, various stakeholders, and government staff. Human-bear conflicts come in the form of damage to property and stored feed, livestock depredation, and public safety concerns. 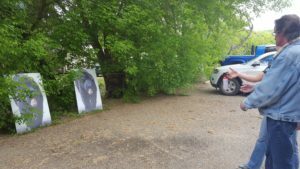 Educating the public on bear awareness and safety strategies, and encouraging a more proactive approach that gives responsibility to the public to do as much as possible to prevent bear encounters is key in limiting the number of habituated and problem bears, and reducing potential safety threats to people. 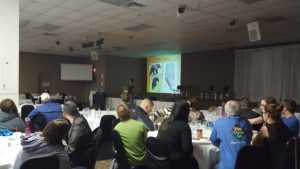 Information provided through Alberta BearSmart programming includes everything from tips on how to manage attractants in an area, to how to properly respond to different types of bear encounters if they occur. Media campaigns, distributed BearSmart materials, BearSmart information booths at local events, and workshops are just some of the ways Alberta Environment and Parks (AEP) staff connect with the public through this program. Managing attractants is first and foremost: garbage, pet food, BBQs, bird feeders, fruit trees, compost, deadstock, recycling, gut piles, camp food, natural vegetation all need to be stored and disposed of properly. Bears may target injured or sick animals – monitor livestock closely 10 days following castration, dehorning, and branding. Dispose of animal carcasses properly – follow the Livestock Diseases and Public Heath Acts. Best to have carcasses removed promptly to a rendering plant. Be cautious when working around cereal crops, especially at dusk and dawn. Maintain your granaries, and invest in retrofit grain hopper systems. Clean all spilled and waste grain ASAP – if spillage is unavoidable, locate storage facilities away from areas of human use and known bear habitat. Consider electric fencing – in areas with valuable products or those at high risk of bear-human encounters (i.e. bee hives). Make noise when working or recreating in bear country – let them know you’re around. Stay alert – watch for signs of bears. Travel in groups and keep your dog on a leash. Store all food/garbage away from human and out of reach of bears. Obey all trail and area closures. Carry and know how to use bear spray and noisemakers. Pack out all garbage and keep a clean campsite. Stay calm and assess the situation. If the bear is at a distance and doesn’t see you – move away slowly and don’t yell, leave the area, watch for the bear until you reach your destination. Defensive or Surprise Encounter – protecting cubs or kill. The bear may stand up to catch your scent, lower its head with ears laid back, pop its jaws, woofing or blowing hard, pound its paws on the ground, make itself look larger, make a bluff charge. Don’t run, talk to the bear calmly, slowly back away, keep your eye on it without staring aggressively, have bear spray and noisemaker ready to use. If the bear makes contact, roll onto your stomach and lock your fingers around the back of your neck, spread your legs, if the bear rolls you over immediately roll back onto your stomach. Wait until the bear has left the area before getting up and going for help…it may take a while. Non-defensive or Predatory Encounter – not defending cubs or kill, may be curious or dominant, may see you as a food source. The bear may close the distance between you, show no signs of stress, stare intently at you, circle around, remain quiet, approach slowly, and keep its head and ears up. Don’t run, prepare to fight back, make yourself look big and shout loudly, use noisemaker and bear spray, pick up anything to use as a weapon, if bear makes contact fight back with force. Sometimes the unfamiliar sight and sound of bear spray releasing is enough to deter a bear. The active ingredient (oleoresin capsicum) severely irritates the bear’s eyes, nose, and throat. What to look for when buying – make sure it says ‘bear deterrent,’ check Capsaicin level and size of canister, check expiry date (within 3 years). Using bear spray – Stand your ground, do not play dead, keep tabs on the wind, speak in an authoritative voice and make yourself appear larger, remove safety clip, aim low in front of bear, when bear is in range (9-15m) start spraying in short ½ to 2 second bursts, hold your breath, retreat when attack is interrupted. To conclude the workshop, Courtney emphasized the importance of knowing how to use bear spray, and carrying it with you whenever you are spending time in bear country. Attendees were invited outside to participate in a bear spray demonstration using inert cans (lacking the active ingredient) and life-sized black bear targets, to learn the proper technique for using bear spray.